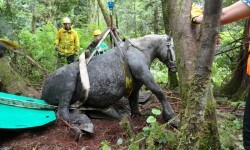 Gemma, who fell over a cliff, is on her way back up. 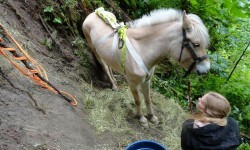 Gemma fell over a cliff and needed help up. Here she is, rigged to go. 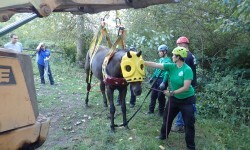 We practice and train throughout the year to make rescue safe and effective for humans and horses. We’re always looking for volunteers! 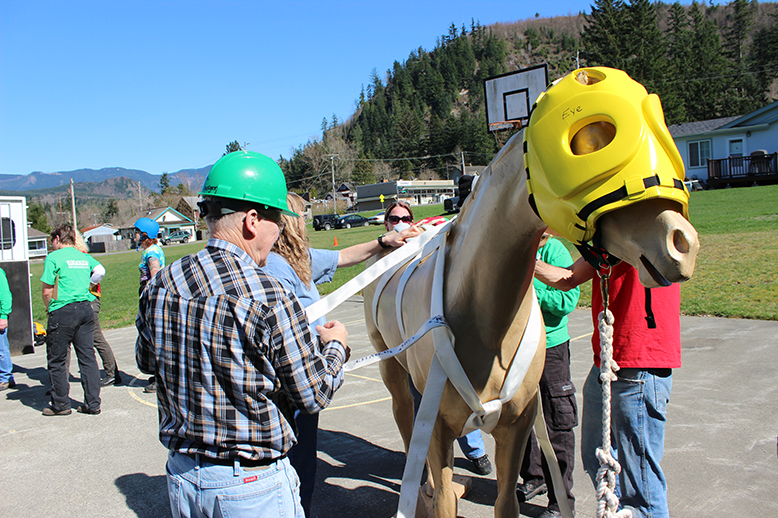 Maverick was cast and needed help up so the veterinarian could examine his injury. 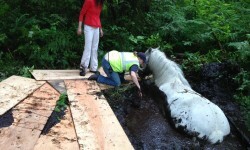 Cocoa got stuck in a bog and needed help out. 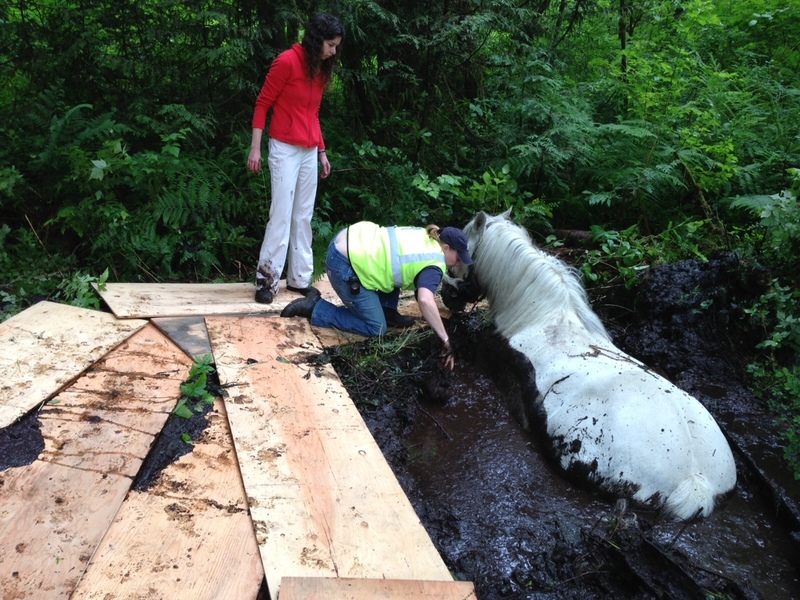 Cocoa, who is normally white, got stuck in a bog and needed help out. 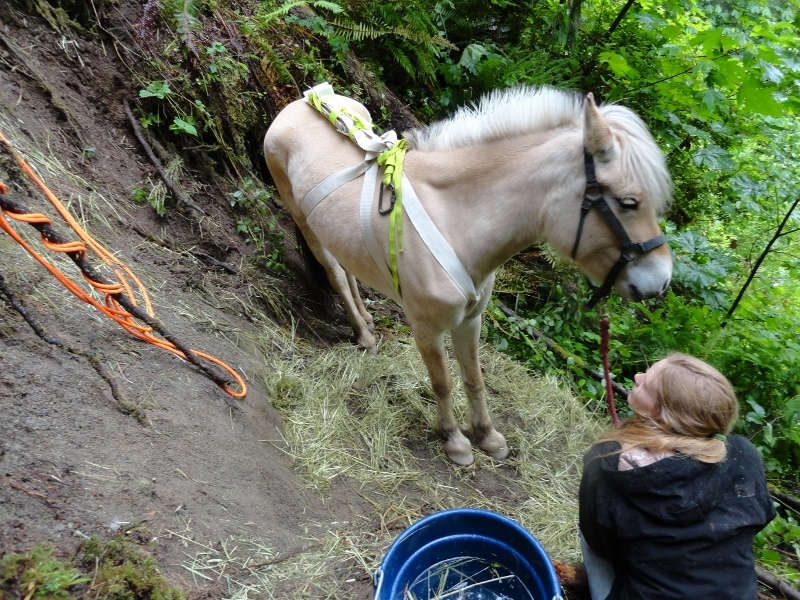 Bossy the cow needed help out of a 175ft deep ravine. 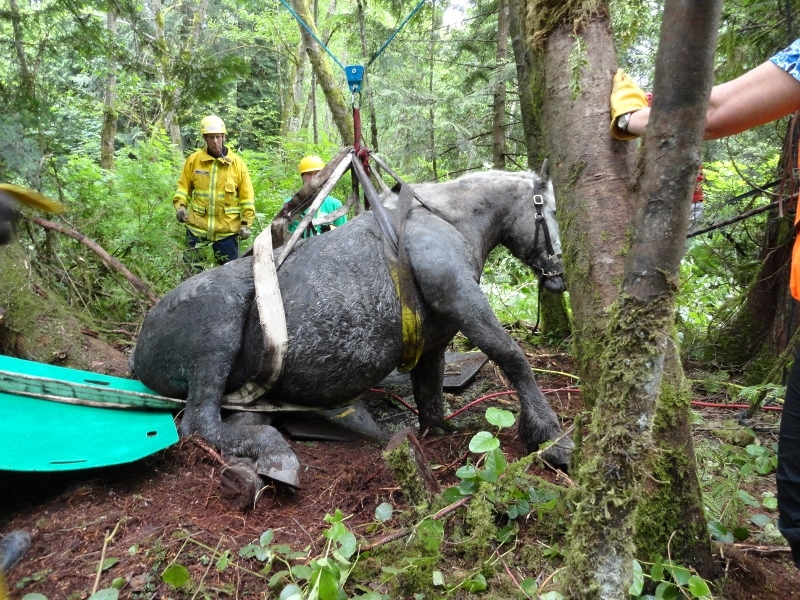 When your horse falls into a well, you need help getting your herd out of the path of a wildfire, or a flood has made it necessary to shelter your horses so you can find safety, the Washington State Animal Response Team (WASART) is trained to help. A 501(c)(3), WASART is an all volunteer-run and volunteer-staffed group dedicated to helping owners and their animals in times of crisis and disaster. 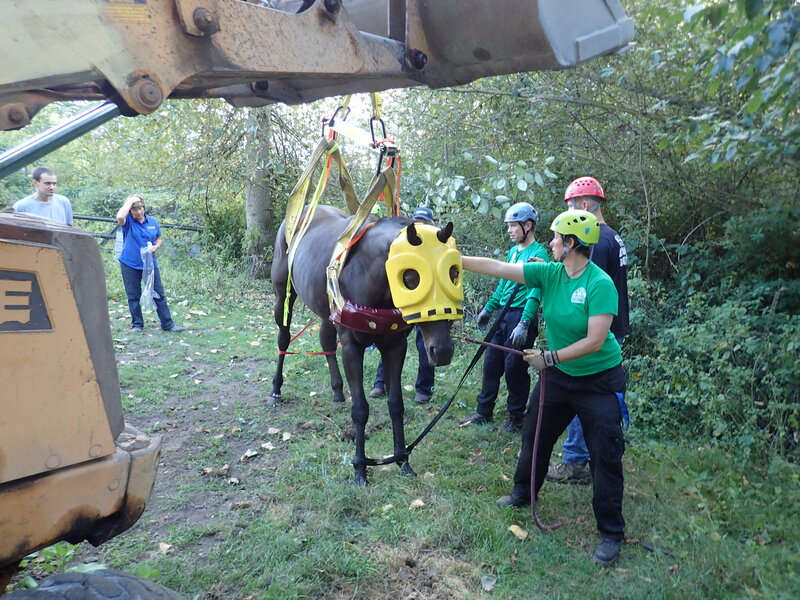 Many members are vet techs or veterinarians, others are specially trained in technical response, such as extracting horses from deep mud, up from over a cliff, or just helping them regain their feet. 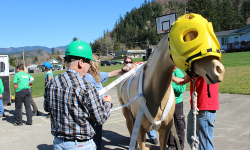 All members ready to assist are trained in the handling of livestock and companion animals including horses, llamas, alpacas, cattle, goats, sheep, dogs, cats, poultry, rabbits, pigs, etc. Don’t need help yourself but looking to help others? 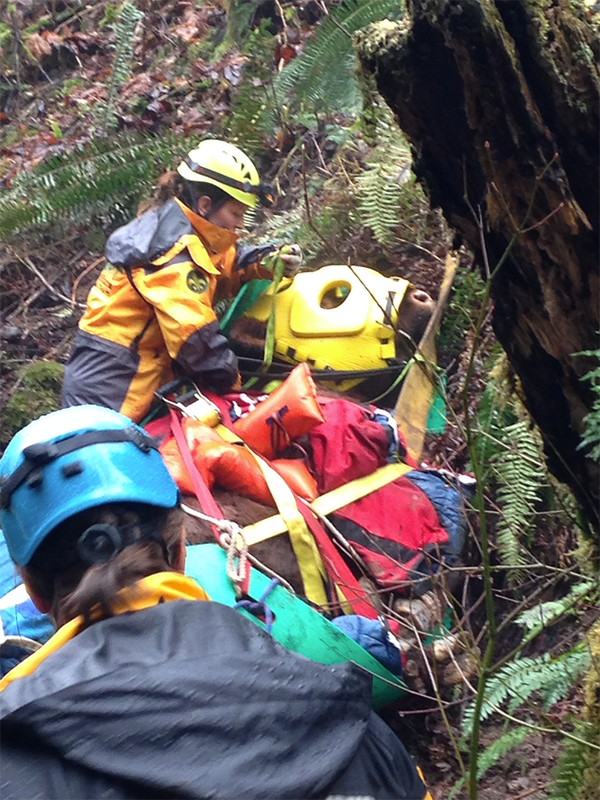 WASART can always use more volunteers for a wide variety of tasks: helping in the field or with outreach, fundraising, hospitality, etc. 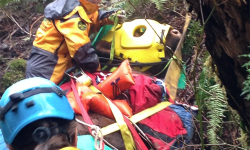 Regardless of your situation, there is probably a way for you to help save lives. WASART is also available to talk to your group about disaster preparation. 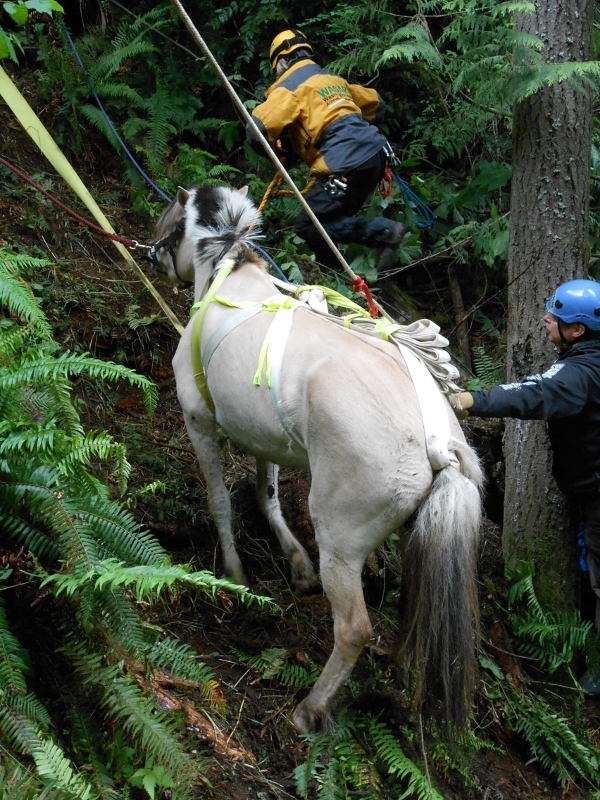 We can help if your horse is stuck somewhere, has fallen over a cliff, or is cast and needs help standing. 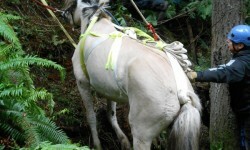 We can also work with your veterinarian.